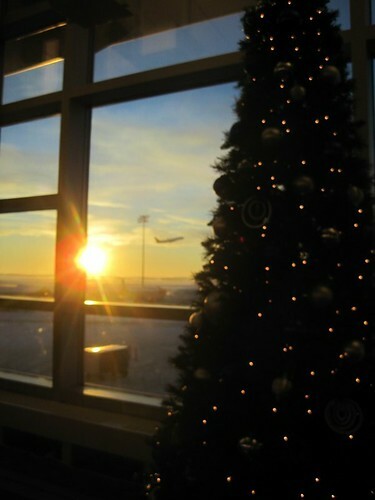 This year was my first Christmas not spent in southern Ontario – my sister and I headed west instead, to Edmonton where our aunt and grandfather are, while our parents celebrated in Australia during their year abroad there. It was an enjoyable holiday – low key, mostly family, lots of food, and very little internet. 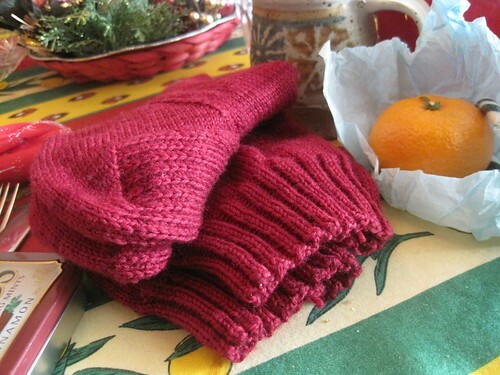 I finished my grandfather’s socks in the nick of time, at lunch on Christmas day. There was even time to knit my aunt a headband for a gift on Boxing Day, to match the hat I’d made her two years ago. 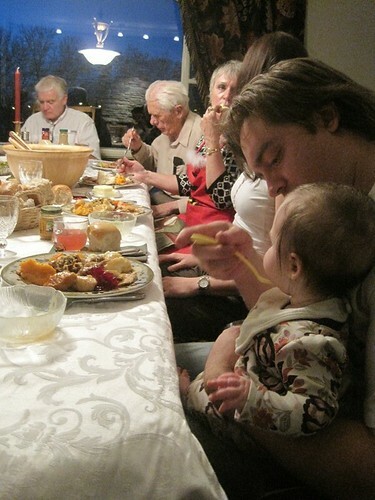 Christmas dinner was a larger affair with many cousins, and 4 generations around the same table. My aunt’s cat enjoyed many new laps to sit in. 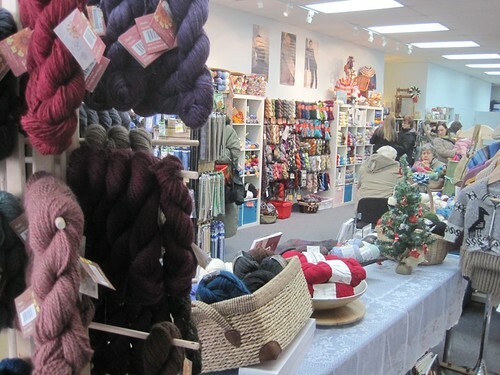 We even paid a visit to a couple of yarn shops – Ewe Love it, and River City Yarns, and I snagged a few nice skeins of things to dream up projects for. And today before heading to the airport, we had a suitably comfort-food-ish lunch of burgers and milkshakes. Edmonton airport is only slightly nutty instead of full-on nutty, and we are crossing fingers for a good connecting flight. Catch you back on the Ontario end soon! 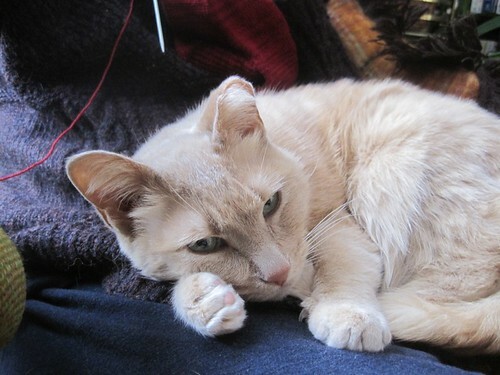 I’m looking forward to a bit more knitting and sitting holiday time before the new year rings in. I hope all your holidays are/have been well. Looks as if it was a lovely holiday. 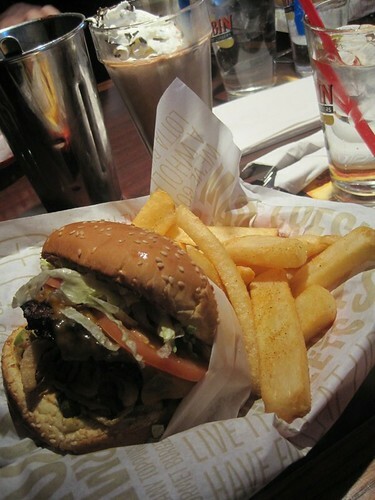 Normally I covet your yarn, but now I find myself coveting your burger and fries. I guess I have had enough fancy holiday food! Hope your flight home was a good one Glenna. We are getting ready to drive to Florida…hope we can get between the snowy areas…LOL I am looking forward to some sunshine, it might be cool but it won’t be -20 C that is for sure. And how did you catch a plane in just the perfect spot for your photo! Dang… That’s a great shot!! Thanks for sharing with us. Awww sweet kitty! Here’s to a year of great and glorious knitting with plenty of ideas and fun projects and LOTS AND LOTS of really cool yarn!!! Happy New Year!! Sounds as though you had a very joyous holiday. Safe travels and can’t wait to see what treasures you found at the LYS during your trip. I am glad I was not the only one knitting just hours before presents were due! The socks look lovely – best wishes for new knitting ideas in the new year! Sounds like a wonderful holiday. It’s fun to celebrate in different places with family. Sounds – and looks – like a wonderful Christmas. That hamburger and milkshake have my mouth watering. Safe return to Ontario and all the best in the new year.